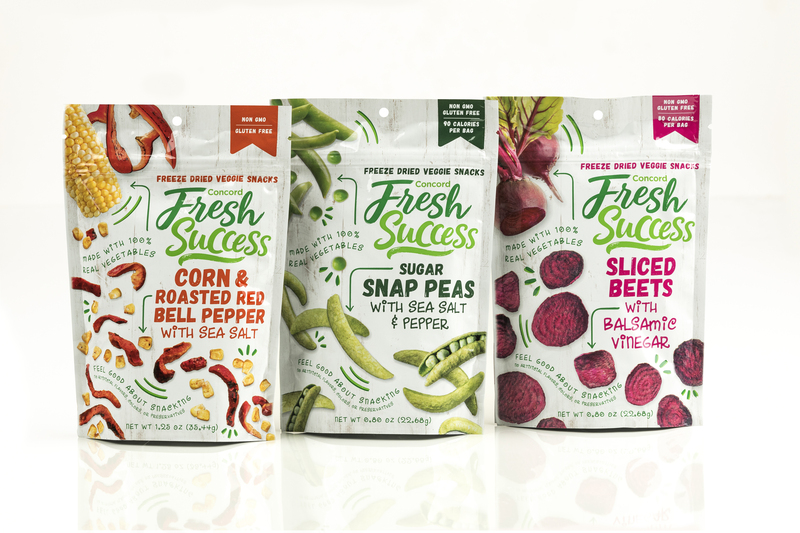 Expanding on its well-established meal solution product line, Concord Foods is proud to announce its new freeze dried vegetable snack line sold under the Concord Fresh Success brand. The new product line, available for distribution in May 2018, includes flavors such as corn and roasted red pepper with sea salt; sliced beets with balsamic vinegar; and sugar snap peas with sea salt and pepper. In an effort to provide a clean, less processed snacking option, Concord Fresh Success Freeze Dried Veggie Snacks are made with 100 percent real vegetables and no artificial ingredients, added sugar or preservatives. The veggie snacks are a direct response to the Mintel’s 2017 Consumer Trends research stating that consumers are looking for on-trend flavors with clean ingredients as the salty snack category continues to rise. Continuing to innovate the snacking category, Concord Foods puts the vegetables through a special freeze-drying method that utilizes the whole vegetable to maintain nutritional values and flavors. While other veggie snack options are available, the Concord Fresh Success Freeze Dried Veggie Snack line is one of the only lines that does not use a combination of additives when processing the vegetables. Concord Foods is exhibiting at Southern Exposure in Tampa, Fla. March 1-3 at booth #128 and will have the freeze dried veggie snacks available to sample. For more information on Concords Foods, please visit http://www.concordfoods.com/ and follow the brand on Facebook, Twitter, and Instagram.